It may require some heavy lifting, but improving cancer registry data can elevate quality care and patient outcomes to new heights. Data collected by local cancer registries have long played a critical role in helping public health professionals understand and address the greater cancer epidemic. And while the industry at large recognizes the potential of cancer registry data to “do good” in the global scheme of the disease, experts stress that opportunities to tap into that potential within the framework of a hospital or a health system are often left lying on the table. “Many times, [registry professionals] have their state registry in mind as a customer … but they need to remember that their own facility is a customer. You want the information to be useful to the organization,” says Dianne Cleveland, RHIA, CTR, national compliance manager for Kforce Healthcare. Organizations such as Aurora Health Care are finding that while cancer registry data can help improve patient care, their ability to effect change, like any compilation of data, is only as good as the quality of information gathered. Lisa Robinson, RHIA, CTR, system director for clinical data registries at Aurora Health Care, points out that the organization’s registry data are scrutinized on a near-constant basis to maintain a level of quality that will benefit providers who access the information. Cancer registries have undergone sweeping reform over the past two years that many believe has the potential to vastly improve data quality. However, experts acknowledge there are growing pains that must be overcome. Couple the changes with an ever-evolving HIT landscape and the need for better physician documentation, and many registrars face an uphill battle to maintain accuracy and quality. For Aurora Health Care to maintain the quality needed for data use throughout its large network of providers and hospitals, Robinson says the cancer registry group must conduct scheduled random analyses. While the minimum requirement for a random sample review as a Commission on Cancer-accredited cancer program is 10%, Robinson says Aurora Health Care is reviewing more than 50% of the data collected. Robinson says her department runs daily reports, sorting through information and passing problem areas back to abstractors as they are found. The ability to run reports that include abstractors’ initials is crucial to this process, she adds, because the information can be corrected in a timely manner, and the constant feedback ultimately improves future abstracted data. “We just keep doing that over and over again. In some registries, it’s not possible to identify the abstractor on the reports, so it’s much harder to keep clean,” Robinson says. The automated GenEDITS software tool provided by the North American Association of Central Cancer Registries (NAACCR) is invaluable for maintaining data accuracy, according to Cleveland, who points out that many managers also employ visual editing techniques. In fact, some states have enacted visual editing standards to use alongside the computer valuation checks. In addition to GenEDITS, Robinson says the lines of communication between abstractors and physicians need to be open and productive to maintain high-quality data. For example, when problems arise with physician documentation, registry professionals can increase the likelihood of receiving a quick response if they make the process as straightforward as possible. While the quality of physician documentation is key to maintaining proper data quality in the cancer registry, Hebert points out that it’s the job of the abstractor to identify and correct these issues. In fact, she believes one of the greatest challenges facing the daily operations of a cancer registry is the ability to find and retain qualified staff. Herman R. Menck, BS, MBA, CPhil, FACE, project manager with the Cancer Surveillance Program of Los Angeles, recently conducted an informal survey of 30 registrars who are considered leaders in the field to garner their thoughts on how the use of EHRs will affect cancer registry data. 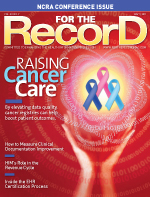 While the HIT movement has created efficient access to information that previously might have been located in numerous locations, industry professionals point out that EHRs are clearly not customized for the cancer registry. Plus, registrars often face the added challenge of having to access information from multiple facilities or sources—all of which may or may not have an EHR in place. Cancer registrars need to get involved in the EHR implementation process early, if at all possible, to ensure that the needs of the registry are out on the table, according to Hebert, who notes that sometimes an EHR may be poorly organized, leading to holes in information gathering. Cleveland believes Health Level Seven International (HL7) standards have the potential to help create efficiencies for capturing data. “Hopefully, in the next five years, we will see that change occur,” she notes, adding that while HL7 is a much-anticipated standard, it is still limited when considering the needs of the cancer registry. “Right now, there are challenges to getting a broader picture of the patient. The data elements are limited and don’t include everything needed. Not everyone [other departments] collects data like the registry does,” she says. As PHRs continue to evolve, Cleveland believes tapping into their information could greatly benefit data quality and accuracy. “Patients are going to create their own personal records more. This could be a reliable method for obtaining information because it comes directly from the patient,” she says. Industry experts agree that the sweeping changes made to cancer registries over the last two years have impacted productivity as registry professionals continue to get up to speed on new procedures. While growing pains exist, many in the industry recognize the potential of these changes. To make use of these expanded elements, the data quality has to exist and the registrars have to be able to capture it—putting education at the forefront, according to Hebert. As the role of the cancer registry continues to expand, Robinson suggests that registry professionals will need to have a solid understanding of biology, anatomy, physiology, and treatment guidelines on a scale that was not required in the past. The last two years were big years for changes in the cancer registry, but professionals fully expect that “change” will become the norm going forward. “As they add data elements to the cancer registrar’s plate, it just proves that we are the best source for that information,” Cleveland says.